So I was strolling through my favorite store in the entire world, Circuit City, and I'm always looking for better peripherals for my gaming. While I'm not a first-person-shooter guy I do a lot of mysteries, role playing, and strategy games, the latter of which hotkey intensive. So before I take my Bluetooth keyboard down to the shooting gallery, I thought I would stop in at the Circuit City to look at a new keyboard before this one bites the dust. mize key response, along with adding lots and lots of customization menus for the macro keys and profiles. However, getting this keyboard out there and getting it in the hands, or should I say under the fingers, of gamers isn't going to be easy. There are lots of other r keyboard out there. There is the G11 and G15 gaming keyboards by Logitech, also with blue LED backlighting that are quite popular. Does the alliance with Razer bolster Microsoft's position in the crowded and competitive gaming hardware industry? Since they attached a $70 price tag to this baby I surely hope so! The design is exceptionally modern. The Reclusa's long oval shape doesn't have any pointy edges, nor does it boast any wave-like design for its typing area. The surface of the keyboard has a glossy, reflective finish, that while really cool reveals every little blotches and blemish, from fingerprints to every speck of dust which is already beginning to annoy me (minimizes word processor to wipe the keys again and spray the thing out). Here is one thing that I can say is working for the Reclusa. Many of use, in fact every probably does at some point, use our keyboards for something other than "poning" that character or taking over that country or firing that huge weapon. The main areas of the keyboard are still function able for everyday use. The gaming design of the keyboard comes out at its sides. 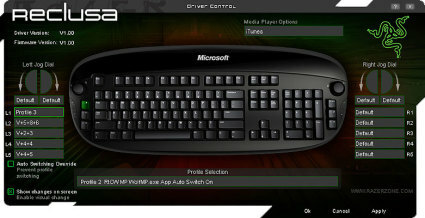 There are the six gaming hotkeys as well as a pair of paddles or "bumper buttons" on each side of the Reclusa. The non-protruding paddle buttons lay flat against the keyboard and over the edge a bit, meaning that you can press down on them or from the side for comfort. These hotkeys and bumper buttons, which we'll collectively call "macro keys," have labels that reveal their default function, (which I changed in a hurry of course!) such as launching your homepage or opening Outlook. Although volume sliders or dials aren't exactly rare on keyboards, we were surprised to see two 360° jog dials on the Reclusa. The jog dial on the right can be used to adjust volume, and the one of the left can perform commands executed by your standard scroll wheel. For instance, turning the dial to the right scrolls you down the page. This good for scrolling through weapons or units at will if your mouse doesn't do this function so well or if you lack fine scrolling altogether. At the same time, these wheels can be changed to your preferred function with a quick click of the mouse in the customization menu. Which, speaking of menus, let me sing the praises of the software that came along with this darling! The Razer people must have hidden in their offices, and not told any Windows people what they were up to when they wrote this, because it bears no resemblance to Windows menus at all! (Yes! There is a god!) It does an excellent job of managing all the menus to customize the keyboard to your taste without being unwieldy. Another really good thing I liked is, unlike before, you can now give more abilities to more keys which makes writing these articles a lot easier and writing in other languages a lot easier. (All those German umlauts I can stuff into one key instead of five!) Everyone who plays hotkey intensive games (and frankly who doesn't?) will like the fact that they won't have to move their hands across the keyboard as much because they make the same key do multiple things just by pushing a few more times to get to the action they need. As for those 2 USB hubs that the keyboard comes with, for some reason unbeknownst to me someone didn't properly power these little guys and they really aren't good for much. So don't bother attempting to actually use them for something. I would just stop by and get another USB hub on your way out the door. 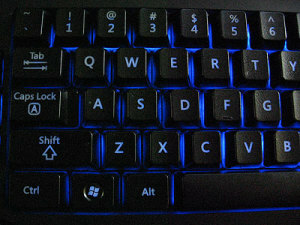 Also, to add a bit more "OO" and "AH" factor to a long, oval shaped keyboard, the Reclusa glows with blue LED blue lights for those of us that like to game in low light or no light conditions or those dark rooms at game stores that they stash the computer gamers. The blue LED back light is nice, but there is no switch for it to turn off in the day when I have the curtains open and the light is streaming in; which makes the device look very odd. I don't know about the readers of this article but I leave my computers on 24/7 and I hope Microsoft sprung for the good LED blubs that way they don't wear out prematurely! So, lets wrap up. Sometimes gaming keyboards stick out like sore thumbs on a fence in a driving blizzard and are useless when used for things other than gaming. The Reclusa is really a good, regularly sized, keyboard that can be used comfortably as your everyday keyboard with a little punch for gaming applications. Its LED backlighting gives it a shiny glow and adds to its attractive and up-to-date design. Enjoy programming all those macros for all those buttons and wheels and especially enjoy the near silent keys that we have all come to expect. No more clunky 90's keyboards for us! If you are looking for a reasonably priced keyboard that fulfills your gaming needs I can safely recommend the Microsoft Reclusa. Now, I need to go take over something somewhere! I got the keyboard and MS Habu mouse. Been having them for the pass 2 months and the mouse scroll wheel is already squeaking like a mouse. Got the Reclusa keyboard and Sidewinder mouse. 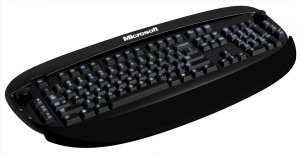 strange how Microsoft decided that they would create a keyboard with blue LED's and rounded edges, and a mouse with red LEDS and sharp edges...they dont exactly match. As far a the keyboard. Its great. Feels nice, looks good.,works great. pity you cant turn the back light off as the keys are shiney and you cant see them when the room lights are on.